1. Prepared brood box (see below) with frames, bottom board, inner cover, Cap n' Ladder Feeder, outer cover, and mouse guard. -- Loosen all frames from your bee-less brood box, so that 8 frames are in the box along with feeder if using mediums. -- Place honey frames near edges of box, then pollen frames. Leave empty drawn frames towards center of box. If mixing drawn comb with new (undrawn) frames, place drawn frames in the center of the box. 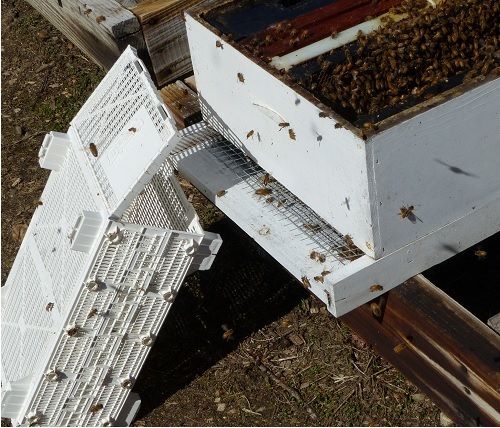 If using new, undrawn frames, place 8 prepared frames into brood box. Place Cap n' Ladder feeder on one edge of brood box. Fill with sugar syrup. 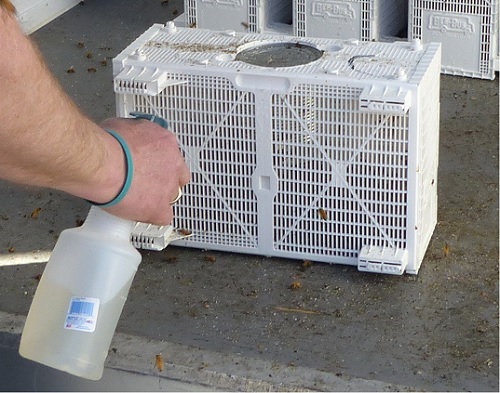 Lightly spray all sides of the package box of bees with sugar-water mixture, to keep the bees from flying. Next, bang the package to move the bees to the bottom of the package box. Lift up the can of sugar water, making sure that the queen cage does not fall into the package and quickly remove the queen cage, replacing the can of sugar water. Look at the queen to verify that she is moving. If there is excess wax, remove some from queen cage. Remove cap on queen cage. Verify that there is some candy, to keep the queen inside the queen cage. -- If using a new frame, use an elastic band to place the queen cage on the frame. -- If using a drawn empty frame, you can push the queen cage into the wax and/or use an elastic band. Remember to keep the entrance up, so it is free from any obstructions. Place frame with queen cage into the center of the brood box, with the queen cage in-between another frame. Beside these frames you should have an open cavity, where you will place the bees. 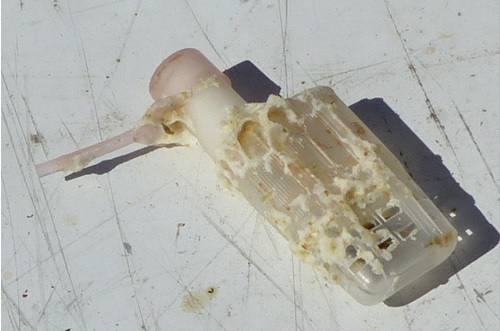 If needed, lightly spray the bees in the package box with sugar-water mixture. Bang the box of bees down, to move the bees to the unopened side of the box. 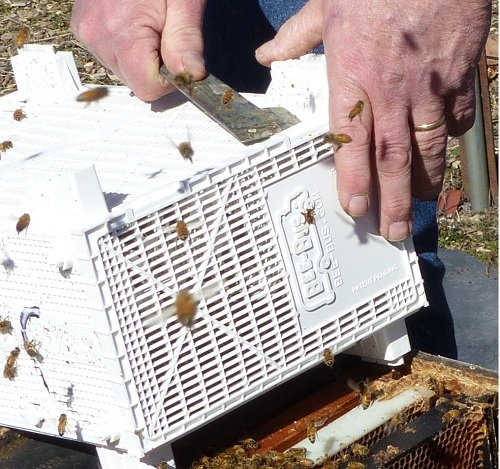 Using your hive tool, open up the box of bees by prying open the two side tabs, making sure you keep the bees inside the package box. You may want to place duct tape or an elastic band over the can of sugar syrup, to keep it in place. 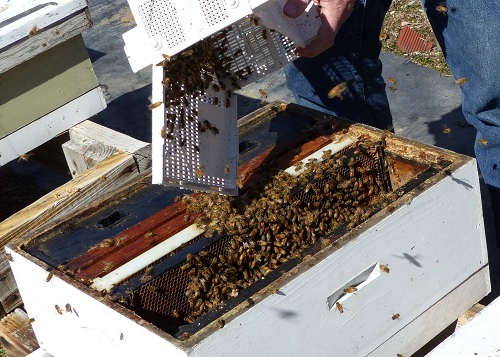 Open the box and shake the bees into the brood box cavity. 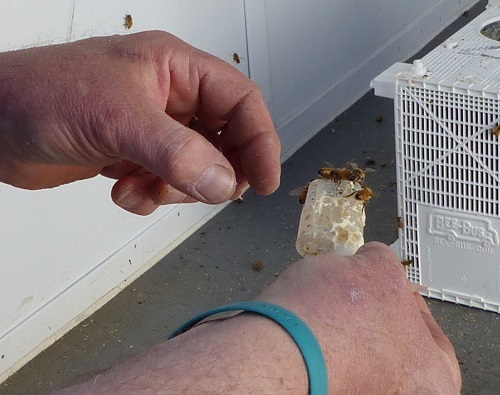 If using a Cap n' Ladder feeder, you can place one of the frames you removed in step 6 over the opening of the feeder, to prevent any bees from falling into the sugar syrup. 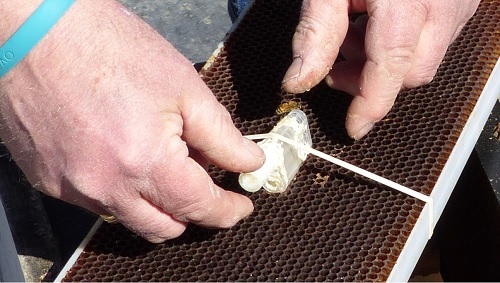 Place the box in the front of your hive, so that any remaining bees will find their way into the brood box. Replace all frames in brood box, medium box should have 8 frames plus feeder, deep box should have 9 frames plus feeder. 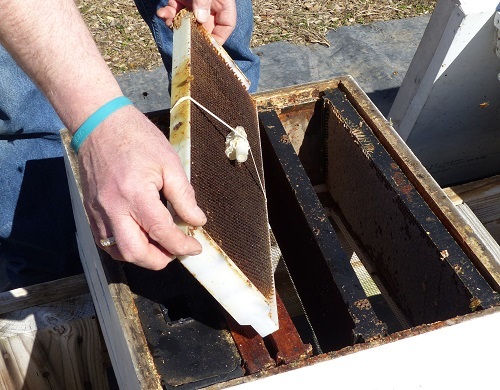 Place any pollen patties over the frames and replace the inner and outer covers on the brood box. Check for queen release in 4-5 days. Be patient and let the bees release her on their schedule!